Kid Dracula (悪魔城すぺしゃる ぼくドラキュラくん, Akumajou Supesharu: Boku Dorakyura-kun?, lit. 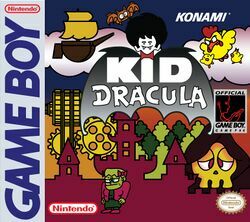 "Demon Castle Special: Kid Dracula") is a comical gothic-themed platformer, and a spinoff to Castlevania. It is simultaneously a remake and a sequel to the 1990 Famicom game Akumajō Special: Boku Dracula-kun (悪魔城すぺしゃる ぼくドラキュラくん, Akumajō Special: Boku Dracula-kun? lit. "Demon Castle Special: Kid Dracula") which was released in Japan only. Konami released the title for the Game Boy in 1993 in Japan and North America. This game is a sequel to the events of the original Boku Dracula-Kun. Galamoth (called Garamoth in the game) has returned and it is up to Kid Dracula to stop him once again. However, he seems to have forgotten most of his spells. Also, many of his minions have turned against him and joined Galamoth. Death remains by his side however, and gives him tips and heirlooms from his father, Dracula, along the way. The Japanese name of the Castlevania series is Akumajou Dracula (lit. "Devil's Castle Dracula"), which is also the name used in most spin-offs of the Castlevania games in Japan, cementing a relationship between the two. The game's main antagonist, Garamoth, later appeared as a boss character in Castlevania: Symphony of the Night. In Symphony, he dropped his cartoon-like appearance and was named Galamoth (due to the ambiguity of Japanese-English transliterations). Other appearances of Kid Dracula include an appearance as a secret item in The Legend of the Mystical Ninja for SNES and GBA, in addition to his appearance in the Super Famicom version of Gokujō Parodius! ～Kako no Eikō o Motomete～ as a selectable character. Kid Dracula is also a hidden selectable character in the game's sequel, Jikkyō Oshaberi Parodius: Forever with Me, which is the PlayStation and Sega Saturn version of the Super Famicom game, Jikkyō Oshaberi Parodius. Additionally, Garamoth/Galamoth appears as a boss enemy in Akumajō Drakula X: Nocturn in the Moonlight/Castlevania Symphony of the Night, appearing towards the very top of the reverse castle. Galamoth would make a reappearance in Castlevania: Aria of Sorrow for the Game Boy Advance as a soul used by the protagonist Soma Cruz to counter the effects of time-stopping magic of the Chronomage creature. Galamoth's relation to Time as well as his conflict with Dracula is further expanded in Castlevania Judgment where he sends a creature known as Time Reaper to destroy his rival. As an inflated float, Kid Dracula would make a cameo appearance in New International Track & Field for the Nintendo DS.